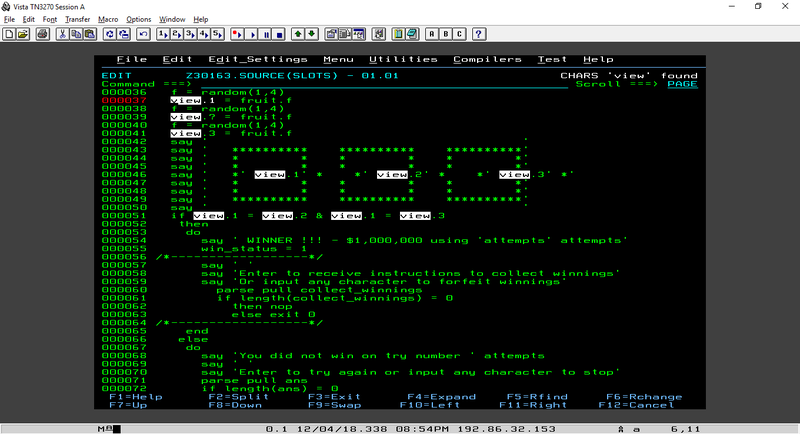 Today I’m tackling the last real exercise of IBM’s Master the Mainframe contest. This will mark completion of all #MTM2018 its challenges. 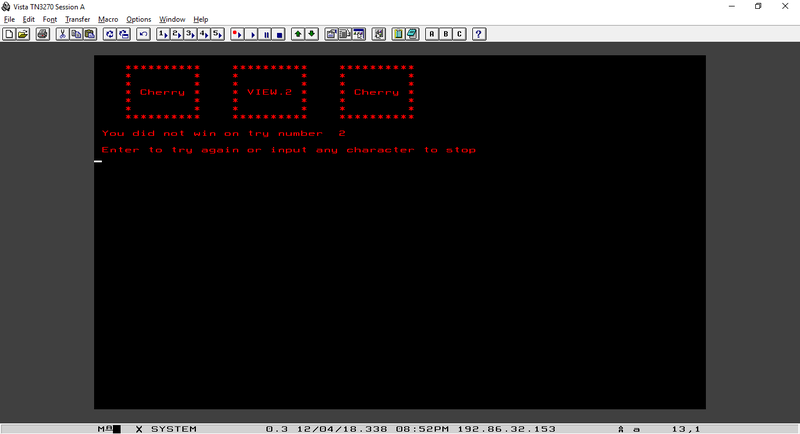 The cherry on top is a challenge about the Rexx scripting language. Rexx is used to create routines that automate many tasks. What makes Rexx so accessible is that the language itself is very simple to understand and that any programming language can execute compiled Rexx. See chapters 3 and 4. There are many other excellent internet sources of information for Rexx such an introduction from a small company in UK and Introductory Rexx Tutorial. Let’s begin! I need to finish this so I can start working on challenge #15. I’ll navigate to Z30163.SOURCE and s slots. After creating a new member I’ll just copy ‘zos.mtm2018.public.source(slots)’ and save it. There it is! Let’s go! Now let’s execute slots using the ex line command. There’ll be errors! Prepare your lifeboat! Hmm… routine not found at line 40. I found the error, it’s pretty simple. Let’s edit and execute again. Huh? Cherry, VIEW.2 and Cherry. Which one is the odd one out? Let’s fix that! Now where can I find view? I’ve spotted the mistake. Hmm… Once you win, you will be instructed to read the slots Rexx code to complete the challenge successfully. Can’t I just read the source code and see what needs to be done? Guess not. I’ve got the numbers 4232 in P3.OUTPUT(#14). Didn’t I need 5 numbers? Huh. 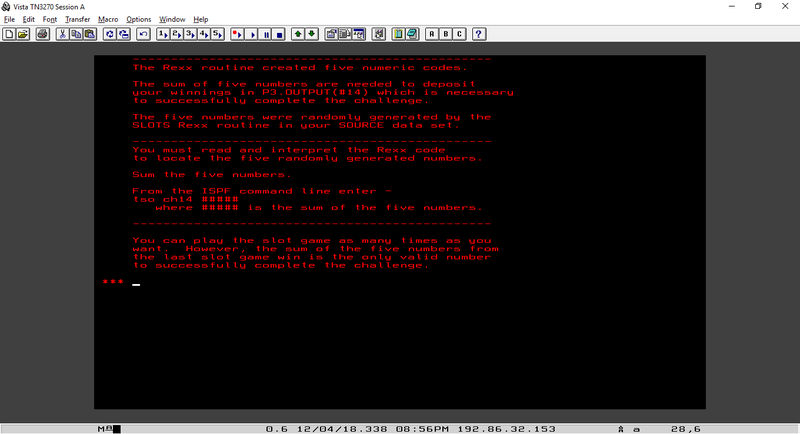 They have an array called ky and add keys 1 to 5 to it. Not to and including? Each ky array key has a random value between 111 and 999. Then they do something interesting at line 000088 to 000090. That’s all I needed to know. I’ll go ahead and tso ch14 mynumbers. I won! I’m expecting my $1,000,000.00 to come any day now. Have you won any money recently? It was Apple, Apple and Apple for me. I too won $1,000,000!!! Your articles about MTM are very educational. Thanks a lot! this is my idea ! JUST ONLY ONE CHANGE …. is that a programming language? what is it?